Song Cook serves up authentic Korean cuisine and a lot of it (good luck narrowing down your order from their extensive spiral bound menu). 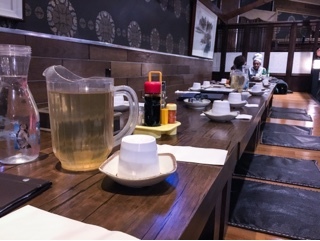 The restaurant has an equally large dining room that’s separated into areas with regular tables or tatami sitting, if you’re in for a truly authentic experience. As a warning, the tatami tables are the real deal: there’s no hidden cut out holes so your legs can dangle, therefore a meal could really be an endurance for your core and flexibility. Luckily, service at Song Cook is speedy, so unless you want to stay for hours, food arrives quickly after placing your order. The menu lists dishes by category (noodles, saam, rice dishes, etc. ), but pay attention to the prices as some are large platters best shared amongst groups of five or more. 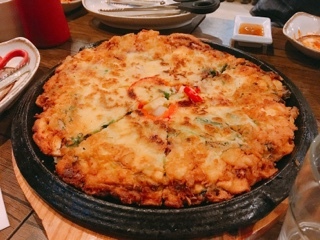 Take the haemul pajun ($27.99), the seafood and green onion pancake could be mistaken for a medium pan pizza. Its sheer size allows for large chunks of octopus, shrimp, and green onion to be incorporated into the batter, which is really like an omelette with glutinous flour added for a bit of chewiness. By itself the pancake can be a bit bland, but a dip into the sweet soy sauce makes it delicious. 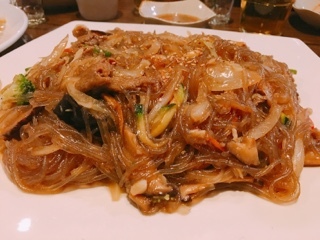 Another platter that feeds a crowd is the jap chae ($26.99), the warm chewy glass noodles tossed in a fragrant sesame oil soy sauce with beef and vegetables. It’s a decent version of the dish but surprisingly expensive for what you ultimately receive. 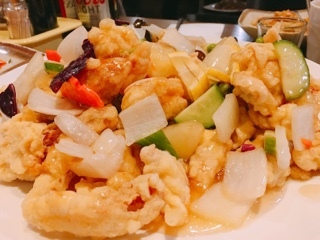 Tang suk yuk ($24.99), a sweet and sour chicken whose sauce, although not the vibrant red variety found in Chinese restaurants, is still flavourful. However, there’s just way too much breading on the chicken itself … really the speck of meat in the middle could be anything. On the other hand, the spicy don ka su ($16.99) didn’t skimp on the meat, with the cast-iron skillet holding two long large pork cutlets. 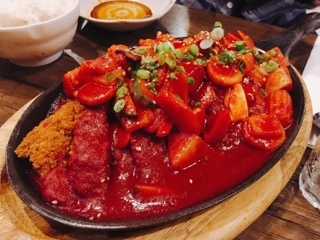 The dish is best eaten right out of the fryer, when the breading hasn’t gotten soggy from the thick spicy sauce the cutlets are smothered in. Overall, the don ka su could have been delicious (I loved the kick from the sauce), but the breading had a stale aftertaste and needed more seasoning. As a warning, their grilled ssam dishes don’t actually include the lettuce wraps (for this you’ll need to add $5). 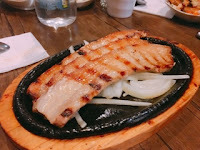 The sam kyup sal consisted of three slices of relatively thick pork belly ($12.99). It lacked any flavour on its own, so really required the sweet bean paste and garlic oil that’s included on the side. Without the actual lettuce and herb garnishes the dish is pretty plain. 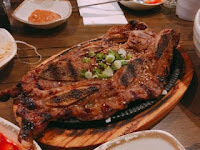 The LA kalbi ($21.99) was better given the short ribs are marinated in a sweet garlic sauce, so is still tasty on its own. Like the jap chae, the kalbi was good, but not outstanding to warrant the much higher price compared to other Korean restaurants. Not everything at Song Cooks is overpriced; most of their noodle and rice dishes are competitively sized and priced. 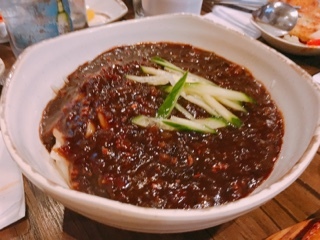 I loved the chewy doughy noodles used in the ja jang myun ($8.99), but would have liked a bit more salt in the thick black bean sauce and the dish served hotter. 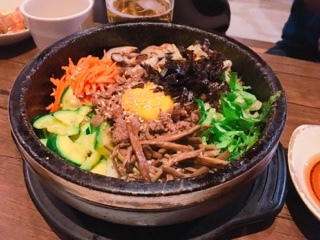 Their del sot bibimbap ($11.99) is fantastic with plenty of toppings and the most wonderful crispy golden crust develops where the sticky rice meets the hot stone bowl. The red bean sauce it arrives with seems spicier, so use less to begin with as you can always add more. 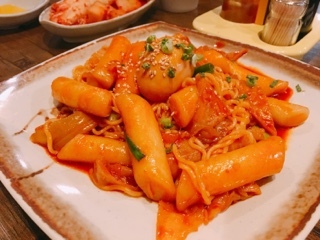 The ddukbokki ($8.99) is stir fried in a similar spicy sauce and intensely flavoured. It’s such a simple but satisfying dish – the logs of chewy rice cakes is addicting. To make it even more filling, we added ramen noodles ($1.00), which is great for ensuring every ounce of the spicy sauce is soaked up. Perhaps what I like most about Song Cooks is the atmosphere … the restaurant is such a great laid-back anything-goes environment. While some establishments may give dirty looks to large rowdy tables, the staff at Song Cook join in the celebration, even demonstrating and introducing us to new drinking games. It’s that friendly attitude that makes me want to return for another order of bibimbap to wash down the 'Hulk Smash'.